Remixlive Mac/PC is a live performance software application, allowing users to utilize loops and one-shots in live scenarios. It has been designed to take advantage of any MIDI pad controller, no matter the grid size. An Expanded Mixer view, includes Mute and Solo buttons and professional three-band EQs on each individual channel. Brand new desktop-class extra audio effects. Map any MIDI controller from any brand, and take control of Remixlive Mac/PC exactly the way you want to! Taking advantage of the desktop platform, Remixlive Mac/PC allows for HQ Recording of your creations in a variety of high quality formats, including: AIFF, FLAC, OGG, WAV. Along with its custom grid size, Remixlive Mac/PC allows for a scalable interface that looks good in every screen size. (It also works like a charm on Apple’s Retina displays). You can now instantly share your music to Youtube. Just provide your login details in the app and click the “Youtube sharing” button when your track is ready! 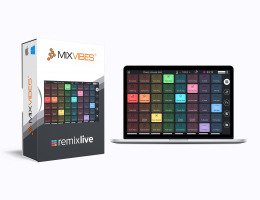 Remixlive Mac/PC comes as both a standalone app as well as a VST container, allowing you to integrate Remixlive directly into your workflow using your favorite DAW. Ableton Link is a technology that syncs the beat, phase and tempo of Ableton Live or any Link-enabled app over the same WiFi network. Sync Remixlive Mac/PC with the Android or iOS versions, with Cross DJ, Ableton Live or any other Link-compatible app. Best of all, it’s simple: enable Ableton Link with a single click. 48 samples per pack: Beats, Basslines, Melodies, Vocals & FX samples. 15 sample packs ranging from Hip-Hop to Dubstep — more coming soon. Sound design by world-famous studio Loopmasters. Create your own packs by mixing and matching existing samples. Royalty-free samples: make tracks that you can sell and distribute. Works on Mac OS, Windows 7, Windows 8, Windows 8.1, Windows 10 (latest Service Pack, 32/64 Bit), 2.0 GHz Intel Core i5 or equal AMD processor, 4 GB RAM. Download a 15 day trial HERE !